Upcoming monsoon may ease Malaysia’s 21-month high palm inventory. 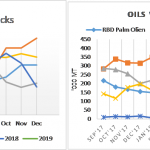 Although Malaysian palm oil inventories has risen to the highest level in 21 months, a heavier-than-usual monsoon may ease the inventory, thus support the crude palm oil (CPO) prices. Malaysian palm oil inventories surged 39 percent year-on-year or 8 percent month-on-month to 2.19 million tons in October, the highest level since January 2016.